A Voyage Long and Strange is a rich mixture of scholarship and modern-day adventure that brings the forgotten first chapter of America's history vividly to life. What happened in North America between Columbus's sail in 1492 and the Pilgrims' arrival in 1620? On a visit to Plymouth Rock, Tony Horwitz realizes he doesn't have a clue, nor do most Americans. So he sets off across the continent to rediscover the wild era when Europeans first roamed the New World in quest of gold, glory, converts, and eternal youth. 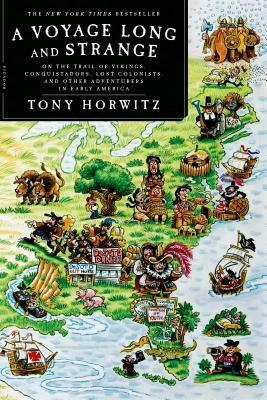 Horwitz tells the story of these brave and often crazed explorers while retracing their steps on his own epic trek--an odyssey that takes him inside an Indian sweat lodge in subarctic Canada, down the Mississippi in a canoe, on a road trip fueled by buffalo meat, and into sixty pounds of armor as a conquistador reenactor in Florida. Tony Horwitz is a native of Washington, D.C., and a graduate of Brown University and Columbia University's Graduate School of Journalism. He worked for many years as a reporter, first in Indiana and then during a decade overseas in Australia, Europe, Africa, and the Middle East, mostly covering wars and conflicts as a foreign correspondent for The Wall Street Journal. After returning to the States, he won the Pulitzer Prize for national reporting and worked as a staff writer for The New Yorker before becoming a full-time author. His books include Midnight Rising, A Voyage Long and Strange, Blue Latitudes, a national and New York Times bestseller about the Pacific voyages of Captain James Cook, Baghdad Without a Map, a national bestseller about the Middle East, and Confederates in the Attic, a national and New York Times bestseller about the Civil War. Horwitz has been a fellow at the Radcliffe Institute for Advanced Study at Harvard University and a visiting scholar at the John Carter Brown Library at Brown University. He lives with his wife, Geraldine Brooks, and their son, Nathaniel, on the island of Martha's Vineyard in Massachusetts.